According to the Bolivian Constitution, all basic services have to be guaranteed by the state, who also has to ensure that they are universally distributed and watch over their quality. However, in 1997 the de Lozada's government started a privatization process across all sectors in the country, including water utilities. Water service and sanitation in La Paz and El Alto were handed over to the company Aguas del Illimani S.A., a subsidiary of Suez-Lyonnese des Eaux, with grants from the World Bank. 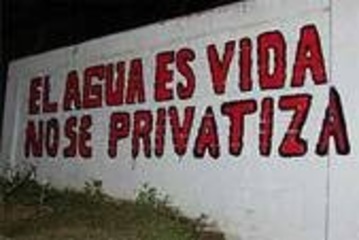 In 1997, in fact, the the World Bank declared that it would stop providing Bolivia with international development grants unless the government of Bolivia privatized the water supply of La Paz and El Alto. Consequently, Alteños have found themselves fiscally constrained by the new contract that controls their water distribution. According to Cultural Survival, "Aguas del Illimani has raised the cost of connecting water and sewage systems to homes in El Alto to more than US$445 per year, a 35 percent increase since it took over. Most Alteños make an average of $750 per year." Furthermore, the company working to modernise the water network discriminated against poor areas, like the whole municipality of Alto for example, which complained about the poor quality of the water service and the high cost of connecting to the network. In January 2005, on the fifth anniversary of the Water War in Cochabamba, a mobilisation of Pazenos and residents of the neighbouring city of El Alto, staged a three day strike and blockades. In order to avoid a repeat of the Cochabamba events in El Alto, current Bolivian President Carlos Mesa and his government indicated in Los Tiempos on Wednesday that they would end the contract with Aguas del Illimani. After suffering years of political deception the president's word did not satisfy Alteños. Fejuve, along with Trabajadores Central Obrera Regional de El Alto (Central Regional Workers of El Alto), unionists, and Aymara from rural and urban areas continued their blockades, strikes, and protests until Mesa promulgated Supreme Decree 27973 with a defined date that guaranteed the termination of the contract with Aguas del Illimani set forth by Bolivian law. Project Details U$52 million investment, derived from soft loans, that means, loans with low interest awarded by the International Cooperation to support through private companies to poor countries. BM U$40 million through the IFC; BID U$15 million and U$10 million from CAF. Increased connection fees 25%. The rates increased from U.S. $ 335-445 for water and sewer. Why? Explain briefly. Despite the withdrawal of the privatization plan, as a result of Suez-Aguas del Illimani leaving the country, the Bolivian State has to pay total compensation of US$15.1 million dollars: US$9.6 million to repay loans from the Inter-American Development Bank and the Andean Development Corporation (CAF), plus US$5.5 million to repay Bolivian Aguas de Illimani shareholders. And the security of water supply has not been achieved yet. Microgobiernos Barriales - Levantamiento de la ciudad de El Alto. Mamani Pablo. 2005 - The Water War. Vandana Shiva.